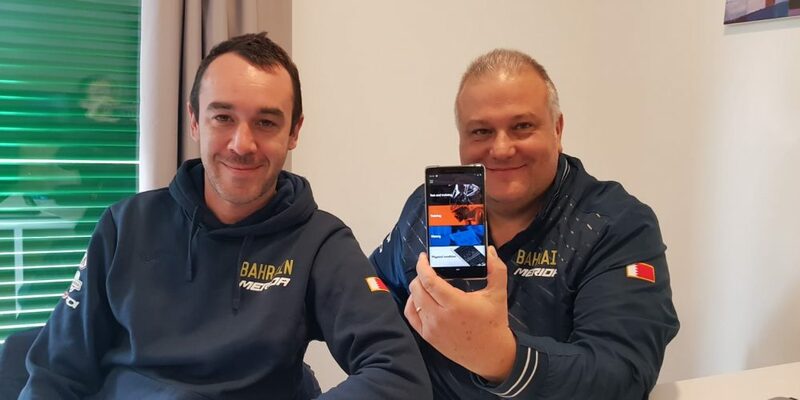 CAMBRILS (SPA): Meeting Paolo Slongo is just like bumping into an old friend. Patient, never moody, willing to debate with you frankly. He seems so far away from the stereotype of a coach who is only interested in the numbers. Instead, he is the kind of person aiming for moderating tensions, strengthened by his own high-level experience and by a placid behaviour. During the training camp in Cambrils, Catalunia, he spared part of the morning for us. 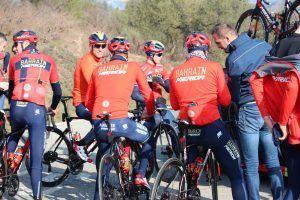 The boys of the Bahrain Merida Team worked hard in a 6-hours long ride. We find Franco Pellizzotti and Gorazd Štangelj in the team car. Instead, Slongo himself is busy checking some files regarding the trainings, preparing the next trip away, on the Teide. He needs to sort out a couple of details about the hotel, but everything else is well-defined. He greets us in his cabin, the number 1104 inside Cambrils Park Hotel. It is the best place to have a quiet chat, since the accommodating structure is overwhelmed with under 20 female foot players of various nationalities during this period. They are going to participate in an international soccer tournament taking place within the city. Slogo in entering his eleventh year as coach among the professionals, it seems an entire life. He has already worked with great champions, some of which he is about to list below. From my point of view, it hasn’t changed that much. In 2008, we have probably been pioneers in the training field, with Liquigas. With Liquigas society, and along with Doct. 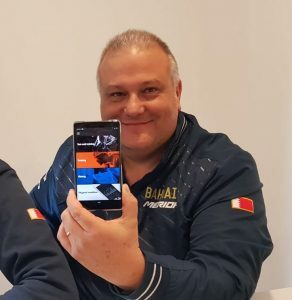 Roberto Corsetti, we shaped and introduced in the team several figures, and I was part of the organogram as well. The goal was to avoid the presence of external trainers, which were very popular in those days. Afterwards, everybody adjusted. Useful improvements spread fast. For example, my figure, the coach, it wasn’t even contemplated at the time. It looked like teams were not interested. They all had their own trainers, with their own programs, and the athletes was supposed to show up at the fixed appointment in shape. It produced confusion. There were coaches with a moral, and other who did not. There were athletes who were not in line with the programs of the team. Hence, an hard situation to deal with. Nowadays a lot has been optimized. The society establishes the head of the trainers and you verify that the job is carried out correctly. We make sure that the training is followed 100% by the inner staff. Inside the team, the coaches have control over the athletes and in this way you avoid a lot of problems. How many cyclists does a coach assist? I follow seven of them. I suppose a coach can assist up to ten. The proportions athletes-specialists given by the UCI are correct. An athlete requires at least 2,5—3 hours per week. Every forty days we run the evaluating tests, especially during the first part of the season. Otherwise, we check upon the different critical powers. There are a lot of ways to avoid errors in the management of the training. We also use advanced systems such as SportPlusHealth. Therefore, thanks to the modern tools, you always have under control the situation regarding your cyclist’s status, isn’t it? I do. I know how to read the tools, about a specific wattage or speed. Running a test in steps, we come close to the breaking point, and I can see if someone has been working or not at home on anaerobic basis, in accord to the needs of a long-distance run. I can understand if an athlete has a basis or not. It is useful to avoid the risk for the athlete to turn off during certain long-distance races. And the weight is already under control? When Nibali needs to lose weight, we start from this premise. We know how much he burns during the training and the value of his basal metabolism. At this point, we have to multiply the expressed average wattage by a coefficient. Once we do this, I share the information with Doct.Magni, who calibrates the diet. In brief. The working methodology imposes a staff. How does it work and who are they? The organization gives you the possibility to focus on your sector. The feedback comes from all the professional figures involved. The physiotherapist, the osteopath, the nutritionist, the mental coach, the masseur, the doctor. And how are they coordinated? Are you the orchestra leader? I coordinate the work and we take a decision together, then it is my job to communicate it to the athlete. It turned out to be an effective system even in the occasion of the accident during the Tour. And how is Slogo taking the arrival of David Dailey, guru of the time trials? He comes from BMC school, where he gained several successes and the last world time trial competition along with Rohan Dennis, isn’t it? I have my autonomy. Obviously, I try to keep up with the times, but I believe in my methodology when in comes to my job. The coming of Australians and British brought confusion in the established point of view. I am a traditionalist, making the aerobic basis first, then anaerobic and carrying on with progressive loads of work. For example, David adopts a work I am inclined to consider as mixed. He starts right away in January, even with the anaerobic. It is a different approach. Anyway, between us there is a good coordination, we are just at the beginning of our working partnership. Of course, you always steal something from those you end up working with. It is a sort of mutual, positive contamination. No fights between schools of thought, then? By no means. Although, I believe that if you want to maintain yourself fit longer, if you look for a structured shape allowing you to undertake a great race, my method works fine. The results you obtained over the years are impressive. During these years I had the luck to train great champions: Aru, Landa, Basso, Sagan, Nibali, Viviani. I worked during field retreats and I brought them in the same gyms. I am talking about the road: Pordoi, Valparola, etc. I have a noted chronology about these periods in February, April, June; I gathered the data of all these great champions and their lactate at the end of the climb. The method of work manages to reduce your errors. There were champions who were too far ahead in their training and we stopped them. I consider fundamental to be credible with the athletes. Which values do you conform to? To the heartbeat in the morning, to maximum and minimum pressure, to the elasticity of the heart during the training. Obviously, to TSS and ATL as well. Who amazed you the most? Peter Sagan. He had two distinctive traits. He was able to work in anaerobic longer than others. He gave us very peculiar hints. And he recovered from the effort sooner. Now, about present time. This year a new, tricky challenge awaits you. In fact, you leave a tested path to compete in two relevant races. Are you going to have extra pressures? Let’s just say that I’ll be the one supposed to deal with this aspect. Vincenzo has to focus on one goal at the time. It would be an error to make too much calculations. We might get wrong one goal and the other. We made changes, but it is unavoidable. It has been some years since we made a significant break. This winter we registered a significant rest, useful for both mind and body. We have been able to practise in the gym regularly, with exercise finalized to strengthen heart, abs, dorsal, also given last year’s injury. Moreover, the first World Tour race is at the end of February. It means to have less stress now and more psychophysical energies which will come in handy later. Is the double commitment feasible at a high level? This year the two races, Giro and Tour, are designed so that you can do well in the both of them.The Giro is challenging in the second part and the Tour is flat in the first week.The body can reactivate in the break after the Giro. One of the rules of quality training is to know how to vary.How does the preparation change year after year? The noted chronology of Nibali says that every year we increase volumes and intensity.This is because you can keep the load better as you get older.If we were to give a figure, I would say that it is 3% of the volumes.Obviously, the training stimulus changes because otherwise the muscle becomes accustomed to a specific stress and would not have the same yield.However, we now expect a program made of racing retreats, unloading periods, gym with works on strenght. The path is traced.We just have to follow it.